Last week, various events at Carnegie Mellon University and around the Pittsburgh area were held to honor the Chinese Lunar New Year, which fell on Monday, Feb. 8 this year. Major celebrations at Carnegie Mellon included a Chinese New Year Extravaganza, which was featured on Friday, Feb. 5, for Carnegie Mellon’s weekly Late Night series, and Lunar Gala, an annual student-led fashion show that consistently boasts one of the largest attendance rates for a university event, which took place Saturday, Feb. 13. Additionally, in Pittsburgh, Squirrel Hill and the Chinese community of the city of Pittsburgh teamed up to host a two week celebration, which featured a Lunar New Year Kick-Off Festival on Feb. 6, as well as an upcoming Year of the Monkey Lunar New Year Parade on Feb. 21, both of which are open to the public. 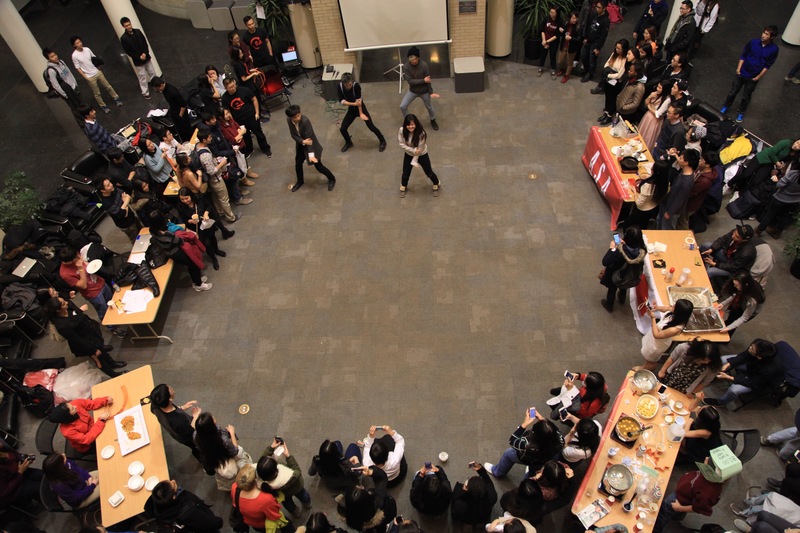 On Friday, Feb. 5, over 400 people gathered on the first floor of the University Center to attend the festivities at the Chinese New Year Extravaganza. The event was co-hosted by the Chinese Students Association and Late Night at CMU, but included participation from numerous other campus organizations. Various Asian organizations — including AKDPhi, JSA, TSA, HKSA, and SIAM — sold food from their respective cuisines, in addition to providing free dim sum, a type of Asian cuisine. Dance performances were provided by the Carnegie Mellon group Sahara, a Bollywood fusion dance group, and Carnegie Mellon’s K-Pop Dance Club, as well as the University of Pittsburgh’s FRESA. Additionally, there were musical instrument performances and a magic show. The extravaganza also featured various cultural games and activities, which included writing calligraphy, playing Ping Pong, and a pre-extravaganza dumpling-making event. Cultural elements were weaved throughout the festivities by the presence of lanterns, the use of the Chinese character “Fu,” meaning happiness, and other traditional Chinese decorations, many of which were brought back from China by students over winter break. In terms of Lunar New Year celebrations, the annual extravaganza is the major cultural event open to the Carnegie Mellon community. Although the Lunar Gala fashion show, covered in this week’s Pillbox section, is a prominent campus event that also honors the Chinese New Year, the actual show is not Chinese New Year themed in any way and is instead a fashion show that relies on the creativity of students interested in fashion, design and dance. Apart from the festivities held at Carnegie Mellon, Pittsburgh residents traveled to Squirrel Hill where they enjoyed an afternoon of live dance and music performances at the Lunar New Year Kick-Off Festival, which featured the Pittsburgh Steel Dragon acrobatic lion dance team, the Pittsburgh Taiko Drummers, the Organization of Chinese Americans Cultural Youth Dance Ensemble and Tzu Chi Academy, Pittsburgh Chinese School, Silk Elephant Thai dancers, Oom Yung Doe Martial Arts, U.S.A. Pro Karate, and the Yanlai Dance Academy, as well as performances on the guzheng and hulusi, two types of Chinese instruments. The festival also featured arts and crafts such as origami, Chinese astrology coloring, dumpling making, paper lanterns, calligraphy, and painting. The upcoming Year of the Monkey Lunar New Year Parade will take place on Murray Avenue from 11 a.m. to noon on Feb. 21, and will feature costumes, music, a marching band, and traditional Chinese and Thai dragons. From Feb. 6 to Feb. 21, participating Squirrel Hill restaurants and cafés will also offer a 10 percent discount via the “Passport to Asian Eats” program, as part of the celebration.